This is a guest post by Joshua Galvin a guest writer. Want to write for us? Check out how here! Although pixellated now, the game was violent for it's day. Nintendo has always had a very family friendly image, even today with its casual family orientated wii games. The Super Nintendo has never been well known for its mature videogames, games such as mortal Kombat and Doom suffered from the removal of explicit violence and gore, which makes it all the more surprising to find a game like Beam Software’s Shadowrun on the console. Set in a dystopian cyberpunk future (2050 to be precise), you wake up in a morgue, with no recollection as to how you got there. All you have in your possession is a matchbox from the ‘wasteland nightclub’, the only clue to your existence. Plunged head first into the murky underworld of a futuristic Seattle, the player is lead into an increasingly dark plot, where facets such as betrayal and murder are necessary to survive. The storyline is surprisingly mature for a game of its time, tackling themes of redemption and vigilantism almost dismissively. 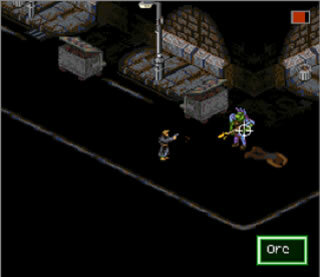 Shadowrun’s game play is a mixture of role-playing and real-time combat, it can perhaps be likened to the gameplay mechanics seen in a lot of current generation MMORPG’s. This is no surprise as Shadowrun is an extension of the role playing tabletop franchise of the same name. Think dungeons and dragons in the future. This may put off many casual gamers used to the innovative simplicity demonstrated by many of Nintendo’s better known games. Even those familiar with the RPG genre may find Shadowrun a challenge. Battles are often left to chance, with weaponry and armour helping increase player odds. Half way through the game you are given the opportunity to learn magic, allowing you to further boost stats and increase the chances of victory. Defeated enemies allow you to acquire experience, items and most importantly money. This can be used to purchase a range of stat boosting items, along with ‘slap patches’ (healing items) which are absolutely crucial to get anywhere within the game. Dialog was just as important as bloodshed, honest. 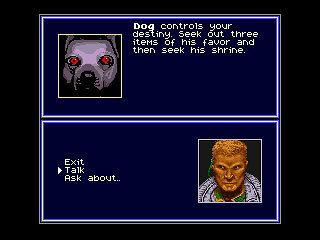 Interaction takes place via a conversation window (as pictured), the player is given a choice of options from a large list. The player can add new words to this list through interaction with other characters. The problem with this system is that by the end of the game, the player has accumulated an extensive dossier of words. Creating a laborious process by which the player must scroll through them all, in the hope that one may grant a response with that particular character. Although elementary by today’s standards, the conversation system was quite ingenious for its time. The dialogue helped add some life into characters and also provided a forum for major plot developments. The experience Shadowrun provides is one of the senses, although the eyes seem to suffer the most. Graphically it could have been much better, sprites are microscopic in their depiction and backgrounds can look very shabby at times. To give credit where it is due, the developers have really tried to push the machine past its capacity, creating an early sandbox style game on the Super Nintendo is no mean feat. It’s a shame the system didn’t see more of this type of adult orientated game on the system, sadly the game has remained a hidden gem amongst titles and is worthy of a play by even the most casual RPG fan. I love what you wrote in this post on this site. I am a big RPG and D&D afficionado, and really love hearing about the latest news on this topic.